Last Sunday, Sept. 18, on a beautiful afternoon that the Lord made for us, more than 60 conference leaders – lay and clergy – travelled from the five corners of the Central Texas Conference (CTC) and gathered at First United Methodist Hillsboro for a three-hour training session around the implementation and progress of the conference’s new organizational structure prescribed in the Exodus Project. Now then, it would be hard to argue if, on paper, such a conclave ranks just above emergency root canal surgery on how you would choose to spend your Sunday. However, the event proved to be one filled with energy and excitement for the CTC’s future and our mission of making disciples of Jesus Christ for the transformation of the world. At the beginning of the meeting, Bishop Lowry thanked those gathered for the sacrifice of their time; after the meeting it was those who gathered who were thanking him for the chance to discuss and learn about the vital changes underway in the conference via the Exodus Project. Change (and the excitement/anxiety that comes with it) was the central theme of Bishop Lowry’s opening address. He compared the shifts the church-at-large has undergone since the 1950’s (especially in the U.S.) to the tides. The Bishop said, “In the 1950’s and 60’s [largely as a result of the end of WWII and the Baby Boom] all you had to do to grow the church was just build a building and open the doors.” He then continued by describing how at that time the church was experiencing a “high tide” of Christianity that peaked by his estimation around 1965 and that we have been in a period of the ebb, or low tide since that time…it just took us 20-plus years to realize and accept it. We now find ourselves in a new reality – a reality in which the excellent programs and procedures of a church at high tide are no longer relevant or sufficient to take on our mission and commission of going out and making disciples of Jesus Christ. Changing the mindsets of our churches (and ourselves) from an inward focus to one that is missional and outwardly focused so that we can quickly respond to the opportunities to be the hands and feet of Christ whenever and however they present themselves today. After his opening statements, Bishop Lowry turned the meeting over to Dr. Georgia Adamson, executive director, Center for Leadership and the Assistant to the Bishop, to give the group a report on the progress made towards our Exodus Project goals so far. 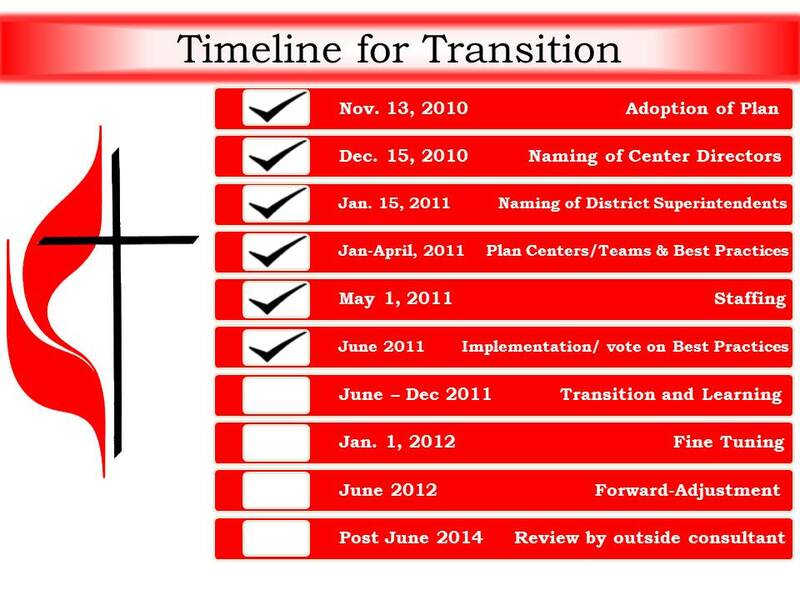 In the graphic to the right (click to enlarge) you’ll see that we are right on target with our plans for implementation. Dr. Adamson also took time to remind those gathered of the Guiding Principles for the Exodus Project (see above left) and then reviewed many of the changes currently underway within the conference and the Conference Service Center. After the review, the gathering was broken up into small groups that went through an exercise designed to help build strong and well thought-out covenants between teams and task forces throughout the conference. 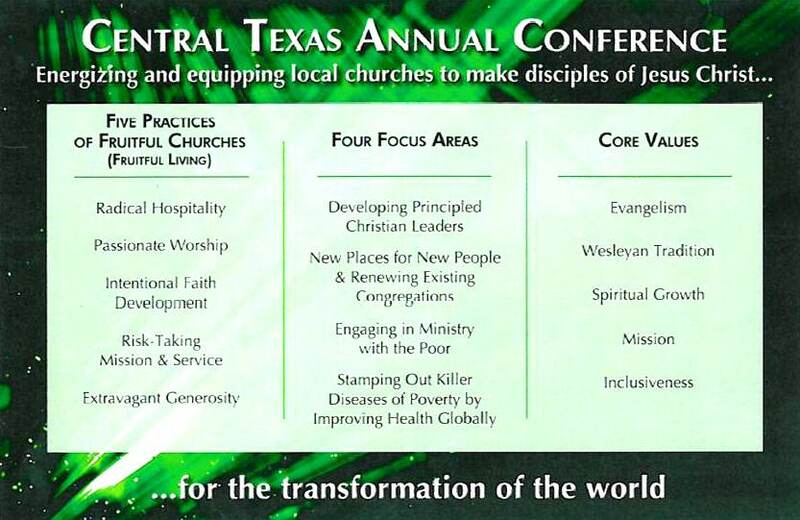 Real change, and all that goes with it, is off and running within the Central Texas Conference. Look for more from Conference Core Leadership team as our Exodus journey continues to pick up steam, but don’t leave it up to this forum to spread the word. How are you helping your church, your family and friends understand the difference the Exodus Project is making in their church, district and conference? Actively engage those around you in dialogues about the Exodus Project and all that comes with it so that the energy and excitement of this new day can more quickly spark into a true Pentecost for this conference, enabling us to unleash the talent, and skills, and love that abounds in the people of the Central Texas Conference upon all the hurting, lost and needy of this beautiful world.